In 2007, Harvard did propose building huge amounts of art and cultural facilities in Barry's Corner, primarily on the current Charlesview site. These proposals contributed to a lot of the excitement and enthusiasm about what Barry's Corner would become and how relocating Charlesview would be a net improvement for everyone. Harvard isn't doing 20 year plans anymore, and Harvard isn't proposing any arts or museums on the Charlesview site. The retail proposed for Barry's Corner is much less than 60,000 sq ft. These changes leave a lot less to be excited about in Barry's Corner. The athletic equipment maker, led by billionaire Jim Davis, plans four buildings at its “New Brighton Landing” project on Guest Street, including a new world headquarters measuring 250,000 square feet and a 175-room hotel rising as high as 20 stories. The company also proposes as much as 650,000 square feet of office space on a nearly 10-acre parcel along the eastbound side of the Massachusetts Turnpike. On a separate parcel across Guest Street, New Balance plans to build a 345,000-square-foot sports facility with an ice rink and track. The company said in the filing that the facility “may contain venues for basketball, tennis, ice hockey, general recreation, track and field,” and a fitness facility. The project includes about 65,000 square feet of restaurant, retail and service space spread among the buildings. Can we have South End-style infrastructure to support South End-style density? Rollins Sq won the John M. Clancy Award for socially responsible housing in 2006. The jury noted that the six-story buildings and four-story townhomes "fit well within its mid-rise neighborhood". It also received a Maxwell Award from the Fannie Mae Foundation for outstanding development of affordable housing and an award from the Boston Preservation Alliance. But buildings like this need to be considered in their context, and the context of Boston's South End is very different than North Allston, particularly in terms of its transportation infrastructure. Using the MBTA map at http://erikdemaine.org/maps/mbta/, here are the subway lines within approximately 1 mile of Rollins Sq and Barry's Corner. Which location is better able to handle large numbers of residents, workers, and visitors? If Harvard was willing to talk about a commuter rail stop, a revived section of the proposed but since mothballed Urban Ring, encouraging Harvard employees to live in Allston and walk or bike to work, or other ways to mitigate/reduce the transportation impacts of Rollins Square style housing in Barry's Corner, I expect that their plans would be received much more favorably than they were last night. 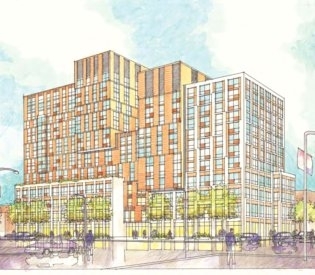 "A local developer will announce detailed plans Thursday night for a long-awaited project to construct a 55-unit condominium building at a highly-visible, city-owned site along Commonwealth Avenue in Brighton... “We’re going to be one of the first ones in Boston to get in on what I think is an emerging condominium market,” said Diamond, declining to disclose the current projected cost of a project that, as of four years ago, was billed at about $18 million." Nice to see that a private developer can build some owner-occupied housing in Brighton. Does this mean it might be financially viable for Harvard to do the same in North Allston? Will a March Madness win bring a new arena to Allston? If #12 Harvard pulls of a big upset this afternoon against #5 Vanderbilt, how quickly will Harvard be able to raise $100M or so to build a new hoops arena in Allston? Why would anyone "throw out" the Ed Portal? This is a very strange story. The Ed Portal could certainly be relocated to make space for new development in Barry's Corner. The new Ed Portal could be completed before the current building would be torn down. So the suggestion that the Ed Portal would be "thrown out" or that there would have to be a year without any Ed Portal really doesn't make sense. “Being thrown out of the building would represent a problem for the various activities we provide for the community,” Lue said, emphasizing the importance of maintaining continuity for the more than 100 children who utilize Portal resources. “Missing a whole season, or two seasons, could really interfere with their progress,” he said. I am writing to follow-up comments that I and other neighbors made at the February 27 public meeting regarding the future of the Speedway building. To fully realize the potential of a rehabilitated Speedway and help create a financially and operationally feasible project, it is essential to consider the future of the abutting properties. Adjacent to the the Speedway buildings are blighted and underutilized properties owned by the State and Harvard University. Harvard's property (the former Toureen Kennels / Brighton Animal Hospital) has been vacant for several years and I expect that demolition is the only viable option. If Harvard refuses to engage in constructive discussions, eminent domain should be considered. To this end, I hope that DCR will reach out to Harvard, the Smith Health Center (who is leasing some or all of the State's adjacent property), and any other related parties to identify strategies for collaboration that can maximize the potential of this set of parcels. If nothing else, this holistic approach might find opportunities to create shared parking facilities among various future users. This could address the limited space for parking at the Speedway which was noted as an obstacle during DCR's public design charrette. The former site of the Boston Herald for more than 50 years, at 300 Harrison Ave., is 6.22 acres. National Development’s plans call for the construction of three new buildings, which would all be between 70 and 100 feet high, and the reuse of the existing Boston Herald building, mainly for its foundation. The four buildings would be five, eight, eight and nine stories high and together would be nearly 550,000 square feet. There would be 471 new residential units and a total of about 85,000 square feet of retail space, including a 30,000-square-foot space for a grocery store and multiple smaller, ground-floor spaces for retail and/or restaurants. Harvard is suggesting that 200-400 apartments could be built on 2.5 acres in Barry's Corner. 1282 Boylston St is a recently approved project of a comparable size (210 units, 331,000 sq ft) on a 1 acre site of a parking lot near Fenway Park which was home to a McDonald's until 2009. The 331,000 square foot project that will be developed by The Abbey Group will replace an underutilized surface parking lot with 12,000 square feet of ground floor retail space, 88,000 square feet of office space, a 295 space below grade parking garage, and 210 housing units, including 21 affordable units. The $150 million project will include a 2,700 square foot ground floor community center furnished with computers and presentation equipment that will be maintained by the building management and available for use by the neighborhood. Why not develop more Barry's Corner? I mentioned below that Harvard proposes to develop only 2.5 acres of Barry's Corner's northwest corner. From my perspective, Barry's Corner and this area would benefit from as much new housing and retail as possible, so why think small? The parcel bounded by Western Ave, Smith Field, North Harvard Street, and Harvard Athletics is 6.5 acres. Developing more land = more housing, more retail, more people enlivening the area, more jobs, and more general economic activity - all of which are good things. Maybe there isn't enough demand for that much housing and retail, I don't know, but it would be hard to argue that the existing uses are the "best and highest uses" possible. Everyone likes Harvard's Ed Portal, and it could be relocated elsewhere in Allston either temporarily during construction or permanently, and alternative office space for the 10-person staff of the Silk Road Project could be found elsewhere. But if the demand exists, then I hope Barry's Corner can get the biggest boost of energy that it can. Harvard is describing its proposed Barry's Corner apartments as being "market rate" and the project as being "market driven". There was discussion last night about what that really means, and what the rents would be in such a situation. There isn't much comparable new construction in Allston, but here are a couple examples from the Longwood area that might be relevant - these 2BR apartments are $3,825 and $3,950 per month. The Trilogy on Bolyston Street is a "first-class", luxury building and Harvard wasn't clear if it envisions something on par with this, but in the meantime we can consider this to be a possible high-end of the range for rents. Between now and 2020, the Boston metropolitan area market will face an additional shortage of nearly 11,000 units, leaving many of the region’s teachers, firefighters, nurses, and other workers vital to the area’s economy priced out of the market. The ability to house workers in key workforce housing employment sectors—teachers, health care workers, police officers, and firefighters, among others—is vital to the economic sustainability of the Boston metropolitan area. Workforce renter households, particularly those with three or more persons, are largely priced out of the market for new-construction rental apartments. The high cost of land, entitlement, and construction makes developing new rental housing for these households challenging, if not impossible, without creative public financing solutions and other subsidy mechanisms. One of the questions at last night's Harvard Allston Task Force meeting was about the specific size and location of land that Harvard proposes to use for the construction of new retail and apartments in Barry's Corner. Harvard didn't offer an exact boundary perpendicular to North Harvard Street, but it looked something like this. According to http://www.daftlogic.com/projects-google-maps-area-calculator-tool.htm this is 2.5 acres.